A-4 “Passport” is a rare version (C 295-2). 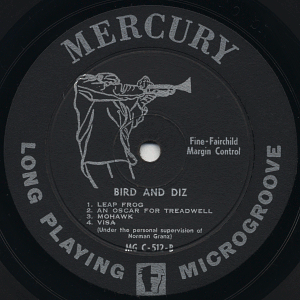 More common version (C 295-5) and B-4 “Visa” are also issued on Mercury 11022 (78rpm) and 11022x45 (45rpm). A-1 “Bloomdido” (C 410-4) and A-2 “My Melancholy Baby” (C 413-2) also issued on Mercury 11058 (78rpm) and 11058x45 (45rpm). A-3 “Relaxing With Lee” (C 415-3) and B-1 “Leap Flog” (C 414-6) also issued on Mercury 11076 (78rpm) and 11076x45 (45rpm). B-2 “An Oscar For Tredwell” (C 411-4) and B-3 “Mohawk” (C 412-6) also issued on Mercury 11082 (78rpm) and 11082x45 (45rpm). The famous summit of key-persons of Be-Bop - Bird, Diz and Monk. This LP features the historically important session by the three giants - Charlie Parker, Dizzy Gillespie and Thelonious Monk. 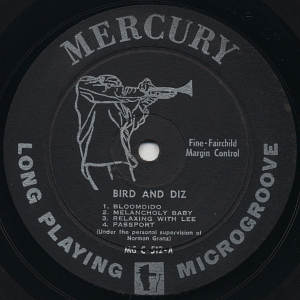 Superb improvisations by Bird and Diz, as well as less-featured Monk plays impressive solos on several tracks. As many people have pointed out, the only drawback was the drumming of Buddy Rich - Buddy Rich himself is one of the greatest drummers of course, but his musical conceptions don't smoothly matches with Bird and Diz. Anyway the performances on this LP are very important indeed. 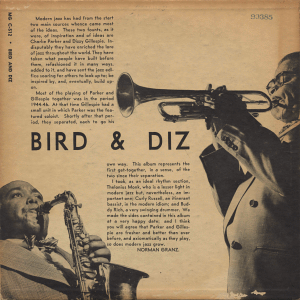 By the way, A-4 and B-4 are not by Bird=Diz combo: these two tracks are from completely different sessions, featuring Kenny Dorham and Max Roach. They are also superb, though. Personnel/recorded date/master numbers confirmed with the Ruppli's discography. Al Haig (p), Tommy Potter (b), Max Roach (ds), Carlos Vidal (bongo). Recorded in New York City, February or March, 1949. Al Haig (p), Tommy Potter (b), Max Roach (ds). Recorded in New York City on May 5, 1949. Thelonious Monk (p), Curly Russel (b), Buddy Rich (ds). Recorded in New York City on June 6, 1950.
visitors to this page since January 25, 2005.